This ESL lesson plan contains practical ideas for teaching the alphabet to beginner (A1) level students. It includes a lead-in activity, several ESL activities and a couple of games. Our lessons are designed for low resource classrooms, and all you´ll need is a whiteboard and some students. The best way to view this content is through the TEFL Handbook app, so we encourage Android users to go check it out. Start by adding the alphabet to the board, eliciting as much as possible. 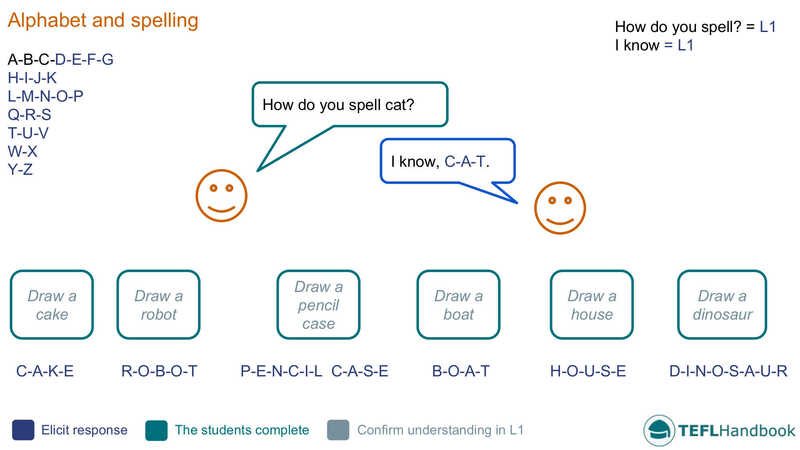 Then add the dialogue, using the students' L1 to clarify if you can. After that, draw some simple objects at the bottom of the board, add the spelling below and practise these as a group. Finally, the students can act out the dialogue in pairs, using the different words from the board. Students have to recognise and say different letters of the alphabet based on your instruction. If you have used the sample board, point to different letters at random while the students shout them out. Alternatively, you could move around each student in the class and have them reply individually. 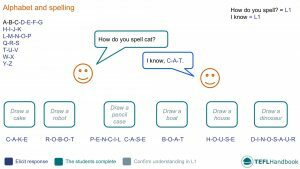 A simple writing and speaking activity that gives students the opportunity to practise spelling words out loud for their classmates. The students have to think of three words not already on the board and write them down in their notebooks. Let them know that they are going to have to spell them out loud later. If they don't know how to spell a word, encourage them to ask you using the dialogue from the sample board. Once they have finished writing, let the students spell their words out for the class. This fun classroom activity will test your students on the alphabet and vocabulary. You'll need something that the students can throw around the class. Anything from a teddy to a paper ball should work. Tell the students that they must throw the object to another student while shouting a letter of the alphabet. The student who catches it must then say a word beginning with that letter. When students get good at this activity, you can turn it into a fun game. Here are a couple of group games that English teachers can use to teach the alphabet and spelling with beginners. As usual, our games require the minimum of resources (whiteboard, markers...and some students). Students must spell words correctly to claim squares on a grid for their team. On each turn, a student must spell a word correctly to claim the square on the grid. Make the centre square the most difficult. If you need a more comprehensive selection of words, check out this list of beginners vocabulary on eslgold.com. A fun group game where students have to guess an object from its first letter. On each turn, the ‘spy’ informs the other players that they are thinking of a word beginning with a particular letter. The other players have to guess that word. The player who guesses the correct answer becomes the new spy. Easy! Teacher: I spy with my little eye, something beginning with D.
Student: Is it a desk? Student: Is it a door? If you are looking for further activities to beef up your lesson planning options, have a look at these ESL resources from around the web. Eslkidstuff.com has a comprehensive list of activities and games that can be used to teach and practice the alphabet. As the name suggests, these fun and interactive ESL activities are geared towards children. If you're looking for worksheets, islcollective have a great collection. Our personal favourite is the capital letter tracing sheet. Have the kids use colours to combine alphabet writing practice with colour vocabulary. Add video and music to your lesson. The people at Natural English have a great video which connects letters, vocabulary and images through a catchy song that your younger learners will love. We hope that you've found a few of these ESL activities useful. Our suggested next lesson is Numbers 20 - 100. Be sure to check out our complete list of ESL lesson plans for beginners (A1 Mid-level), as well as the complete collection. Also, if you are an Android or iOS user, this lesson plan is available for free on the TEFL Handbook app. An ESL lesson planner for English teachers.